I wanted to write about the touching plight of a mother duck and her five babies right after I happened on the scene a few weeks ago. But continuing problems at my co-op distracted me. And I was still feeling low with bronchitis. On a beautiful Sunday in June, Honey and I went for a walk in Silver Lake Park in nearby Baldwin, Long Island. We’d been there the day before, and I was delighted to see five ducklings following their mother in formation. I’d forgotten to bring my camera, so we went back again, this time with my Canon PowerShot. No sign of the new family. After our usual circle around the lake, I stopped to look at the view this perfect afternoon — sunshine, sparkling water, trees, flowers, geese, ducks, seagulls, one egret. 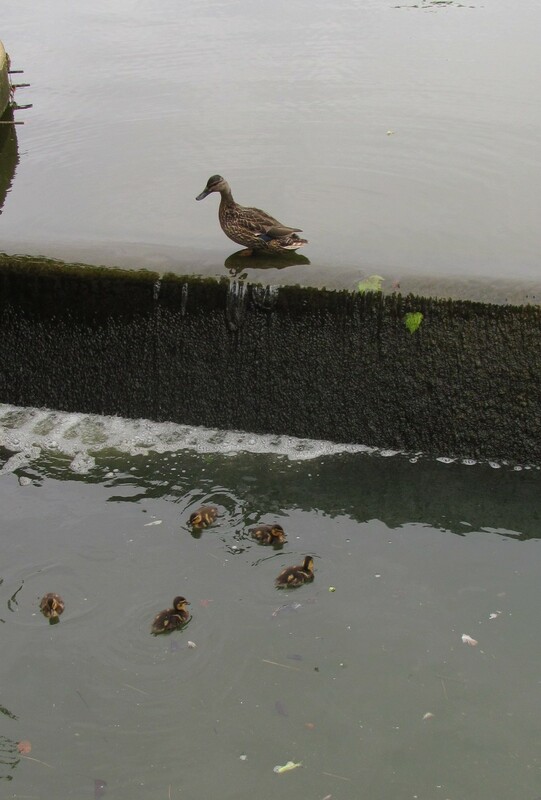 As I leaned on a fence over a basin where water streamed down a cement divider, I saw the babies in the pool below, swimming frantically under a foot-long waterfall, with the mother quacking above them. She alternated diving down to be with them and flying up again, spreading her alarm to other geese and ducks swimming towards her. I couldn’t just keep walking. After getting advice from a man nearby, I called 911 and was told to call a wildlife rescue number — a recording answered. Then I called the local precinct, admitted this may not be a real emergency,and asked if someone could come to help A young officer, Brian, soon arrived in his patrol car. We decided a net was needed, and he went off to ring doorbells, returning with a pool net and a neighbor carrying another one. 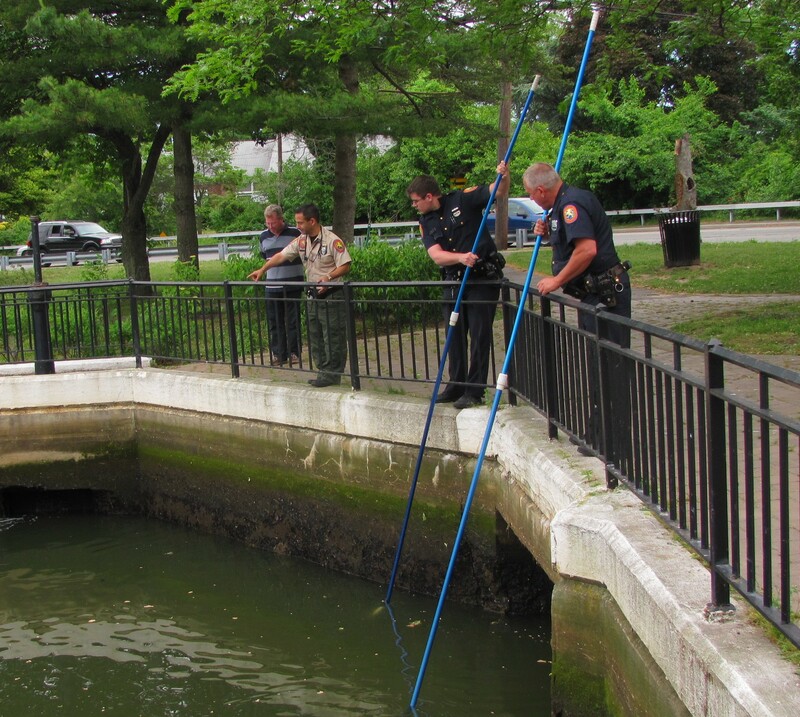 A second patrol car drove up with two more policeme — and a small crowd, including excited children, collected to watch Brian and the woman try to scoop up the ducklings. Frightened, they swam dizzily and were too quick to catch. The mother protested, too, flying and flapping in the air over them. We all cheered when Brian caught one baby and deposited it in the lake above, joined by the mother who stayed by its side for a few minutes — then dove into the pool to be with the other four. The fifth dove in after her — wanting to be with family, rather than safe and alone A loud groan from the sidelines! Then the six ducks swam beneath an archway where the lake flowed under the street to a canal on the other side and disappeared from sight. People assured me the little creatures would find their way out. I hoped they weren’t confused in the dark, but decided to go home with Honey, who had seemed interested in the event. Nothing else could be done for now. I went up to Brian, who looked dejected, thanked him and said he’d helped restore my faith. A grumpy, older officer asked: “Faith in what?” I replied: “In humanity? In the police?” No reply. Just a frown. I called the precinct the next day to ask what happened after I left, but Brian and the others were off duty. Honey and I drove to the park and — wonder of wonders — the water in the basin was level with the lake — I’d never seen that before. And momma and her babies were contentedly paddling together near the shore. Mother Nature to the rescue. Robert McCloskey’s beloved picture book, “Make Way for Ducklings,” comes to mind, wherein a kindly policeman stops traffic for a mallard family as they parade to and from their home in the Boston Public Garden. We’re all on the same voyage, and a little help with navigation is nice. Years ago when the New York Daily News, celebrating St. Patrick’s Day, printed a map of Ireland showing where families originated, I was delighted to see my surname on a little dot of land off the coast of County Down. Both my parents’ forebears were Irish, but my father’s name, Copeland, was suspiciously British — not considered an advantage in some quarters. Later, I discovered the dot was Copeland Island — surely a sign that my family had an auspicious beginning — with its own private land mass. Then I considered the possibility that Copelands rowing over from the British Isles weren’t allowed to come any closer. Now I know there are actually three small islands: Big Copeland, Lighthouse Island, and Mew Island. Over a century ago, Lighthouse Island had a population of about 100 and a schoolmaster teaching 28 pupils. Today, the islands are nature sanctuaries, and a ferry carries passengers to Mew Island where a new lighthouse was built. My great grandfather, James, was born in northern Ireland . I haven’t found his family history yet, but hope to research it someday. And maybe take that ferry ride. Ben and Mary Ann (Kelly) Copeland , my grandparents, were memorable enough for me. Ben’s father’s first wife died, leaving several children, and he married Matilda, who gave birth to Ben and his sister. 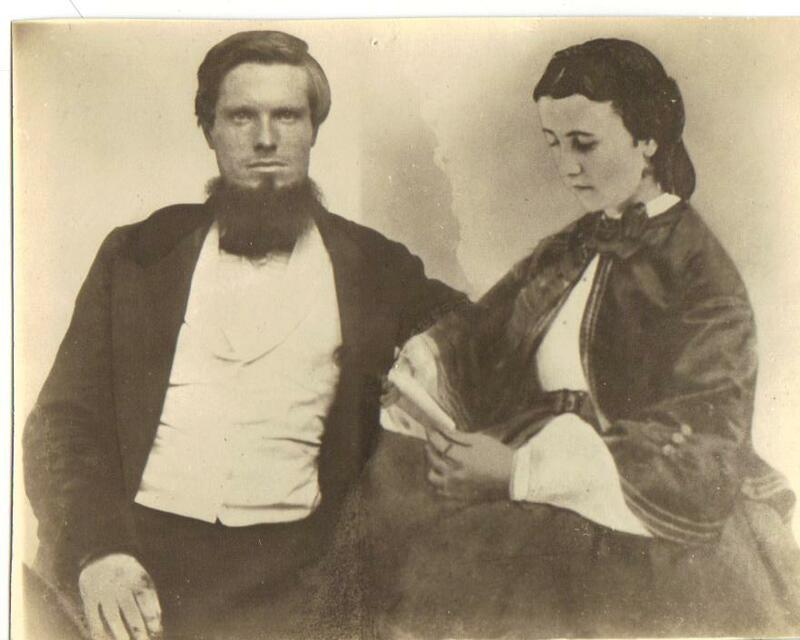 When Ben’s mother died he, his sister and step-siblings were sent to an orphan asylum, coming home when my great grand-father married again — a titillating family story. A treasured photograph of my great grandparents is shown above — one of my father’s sisters cut off the first wife’s picture, and attached one of the second wife’s instead. I heard Grandpa worked at a race track when young, and was impressed he’d been a jockey — his height and build fit the profile. He’d actually been a trainer and groomer, but did ride to exercise horses. Then in the 1910 census he was reported to be a marble cutter. Later, he owned a convenience store in New York City and the family lived behind it, now including my father and his two younger sisters. WWI troops passing through were good customers, and Ben prospered. He sold candy, too, and to the envy of my friends, I boasted my grandfather had owned a candy store. Mary Ann worked in a garment shop in the city when she was about 10 years old — hard for me to imagine as a fifth grader with only homework and light chores to interfere with play. Grandma was a serious person most of her life, with a regular schedule for laundry, ironing, cleaning, polishing and even window washing — frightening me as she perched perilously on a sill two stories high. A favorite story was the one about my grandparents, in their courting days, winning a waltz contest. I could picture Grandpa waltzing, but somehow it was a leap of faith to picture Mary Ann dancing at all, though she mellowed considerably in later life. Mary Ann, called Mamie, and Ben later bought a two-family house in Queens, and until he sold the store my grandfather stayed at the shop, commuting home on weekends. Maternal and paternal roots entwined soon after. My mother’s brother, John, and his bride, Hortense, rented the first floor, and he told my mom the upstairs siblings missed the city and needed friends. So my mother invited my dad and sisters to a party. To thank her, my father took her to a Broadway play, the smash hit, “The Cat and the Canary.” It wasn’t just good manners. The rest is family history. They had a big disagreement and broke up for a year — my mother admitted she crossed the street to avoid him. They made up, but my dad lost most of his money in the 1929 stock market crash, postponing their wedding another year, thereby delaying my arrival till 1931. When I found out about this, I couldn’t help thinking I might have had an older sibling to take some pressure off me. It was hard to keep setting a good example for my brother and sister. After dinner at my grandparents’ house, it became the custom for me to take my little sister behind the portieres — long, red velvet room dividers — open them dramatically, and entertain the family with our improvised, free-style dances on a patch of wood floor. The laughter and applause were addictive, and may explain my life-long love of theatre, beginning with plays from “Jack and Jill” magazine performed in my garage, a big blanket serving as a curtain. Of course, I cast, rehearsed, directed, and starred, as well as collected the nickel admission from neighbors sitting in the driveway. My grandparents’ big, fluffy white dog, Laddie, was another attraction at my grandparents’ home. I’d sneak off to pet the gentle animal, then swipe his soft, cotton bed liner. I liked to smell it and hold it to my face as I sucked my thumb — which was verboten then. I’d been weaned early and pacifiers weren’t invented yet. In fact, my mother was advised to apply iodine to discourage the habit. I was soon eventually discovered with the dog’s blanket and that was the end of that pleasure. But I sucked my thumb when I could till I went to school. Obviously, prohibition often results in the opposite desired effect. Grandpa often came alone to our house in Queens, riding two buses to get there. He enjoyed minding me and my sister, giving our mom the afternoon off. I heard him tell her “That woman tried to pull the pants off me again to throw in the wash. I had to get out.” My sister and I would wait on the sidewalk to watch for him coming down the block, and called out joyfully when we saw him coming down the street with the bright balloons he always carried. They usually popped in less than an hour, sometimes in a few minutes. But he never stopped bringing them. Grandpa Beatty and Grandpa Copeland became close friends and often enjoyed playing card games with other pals. But my dad’s father had a sudden fatal heart attack in his mid-sixties while walking Laddie one evening. A neighbor saw him fall onto sidewalk shrubbery and ran to tell the family. The bushes were bent in the shape of his body, and my grandmother and aunts were chilled each time they passed the spot. He’d lived to see my brother born 10 months earlier, but it was generally acknowledged that he doted on my three-year-old sister, Mary Beth, who had inherited his Mamie’s fine features and petite frame. Grandma lived to be 90 — and as I said, softened over the years. She disapproved of alcohol in general, but offered wine to company as she aged, though she never indulged. She’d always been frugal, but kept a supply of quarters and gave one to each grandchild each visit. My sister kept an overflowing jar of quarters on her bureau. I didn’t need a jar since I took my shiny coin to the candy store the next day. We grew up to practice the same styles of money management. I’ve been feeling low lately. It’ll pass, I know — but since I suffered major depression years ago, I’m sometimes afraid another bout may be coming on. And it’s been difficult to return to everyday life after my wonderful visit to Ireland and Mothers’ Day weekend with my son and daughter-in-law — which included a pedicure, champagne brunch, barbecue, blog guidance, and best of all — the pleasure of their company. I either have a cold or allergies, but have been generally miserable, not my usual lively self. I could be sicker — am constantly reminded of that by neighbors in my senior co-op complex who have legitimate problems: including falls, joint replacement, kidney dialysis, heart conditions and stroke. Even worse, some are afflicted with terminal crankiness. However, in consideration of my surviving breast cancer, a mastectomy and a year of chemotherapy 32 years ago, I’ve awarded myself a medal and given myself permission to complain about trivia if I want. When I felt a lump soon after my baby’s birth, I raced to the gynecologist. He asked: “Why are you so nervous? It’s only a harmless milk lump.” He’d advised against breastfeeding, though I wanted the whole motherhood experience. “Why would you tie yourself down like that?” he remarked. No mammogram. No biopsy. Five years later I felt another lump near the first. Probably benign in the beginning, it had turned malignant along with the new one, invading my lymph system. The angelic surgeon who performed the mastectomy told me I’d be fine and live to raise my son. Later on, he admitted the odds weren’t in my favor. But I believed him — and his caring words and gentle touch helped heal me. I’ve since learned that metaphysical slings and arrows randomly shot or aimed at my tender psyche were more hurtful and traumatic than physical illness. While I’m at it, I’m also complaining about the chilly, rainy weather most of May. After the long, snowy winter just past, it’s only fair to expect lots of sunshine now. April showers are supposed to bring May flowers — not more rain. I’ve got a saying taped on the refrigerator: “Life isn’t about waiting for the storm to pass. . . It’s about learning to dance in the rain.” We all know it’s more fun to dance in the sun — or under the moon, if preferred. The weather could be worse, too. The world is more afflicted lately with earthquakes, tsunamis, hurricanes, floods and tornadoes leaving devastation behind. I watched a report of tornado havoc down south, showing a woman interviewed in the remains of her home. As she spoke, her cat — missing for days — ran out of the wreakage. The woman cried its name, snatched it up and hugged it close as she said: “Now, I’ve got everything I need.” Thinking of my Honey, I understood. I realize that allergies, colds and rain may be minor matters, but griping relieves me, though it may not make others happy. My mother and sister, very private people, would listen and say: “You feel better –but now we’re upset. !” What’s actually bothering me are worries kept simmering on a back burner since my librarian career ended abruptly when I was 73. In the interest of full disclosure, I was dismissed/fired/let go. Whatever way you put it, it hurt — but turned out to be one of those blessings in disguise or closed doors that lead to other open doors. And I can thank Honey, the unlikely, initial cause of my dismissal — a shaggy-dog story I’ll tell later. I couldn’t afford to keep my home of 33 years, where I’d hoped to spend the rest of my life, so I took out an ill-advised reverse mortgage to help pay high Long Island taxes, utilities, and oil bills. But after two years, dismayed by plummeting equity, upwardly flexible interest charges and high fees for every transaction, I decided to sell. And I bought a co-op apartment in the next village — a new so-called “Golden Age” development for people over 62 on modest incomes. A year later, disappointed with poor construction, faulty appliances and incompetent management, I wanted to move again, and listed the apartment with the sponsor, the Town of Hempstead Housing Authority. But the few who came to look and showed interest couldn’t sell their own homes in the slow real estate market. I decorated, renovated, bought a new dishwasher and microwave, and convinced myself I was glad to be near Manhattan, ocean, friends, doctors, Honey’s vet, and my church a half block away — not necessarily in that order. I’ve tried to adapt to group living. Got in trouble the first year for growing a cherry tomato plant in the dirt patch in front of my unit. My upstairs neighbor complained she was embarrassed when her guests saw my vegetables. After I threw a handful of Cheerios on the snow for feathered friends, all residents got the following warning taped on our doors: “Do not feed the birds. Their droppings will destroy our property.” The board secretary said: “We all knew it was you, Eileen.” Community meetings are a headache and often end in shouting. I’ve stopped going. My son wanted me to move to Baltimore where he lives, but while I’m well and able I won’t do that yet. We have wonderful visits when he and his wife come here — and it’s only an hour’s flight to their house for me. But I’m keeping my eyes, ears and options open for another home on Long Island. Which brings me, finally, to the inspiration and point of this post. I have one — though you may have wondered. Recently, Honey and I drove out east again to see a small house that sounded too good to be true. It was. I looked quickly as I drove by — shabby looking on a busy highway – and kept on driving. More false advertising. Driving home in a slow line of cars in Patchogue, I heard a sudden clunk — had bumped into the end of a long boat trailer — too long. More trouble! The driver pulled over and I parked behind him. We examined the trailer and I apologized for a small crack in the license plate. To my relief, the good man said: “Don’t worry. It’s nothing.” But he noticed my front plate was missing. I’d attached it myself, apparently not very well. Nervously, I asked him to watch my car while I went to look for it — somewhere back in the middle of traffic. But he ran off down the street, waved his arms, dashed into the road, and came back smiling, holding my undented plate. Thanking him, I said I’d been having a bad day. He’d been having one, too, he told me. Then I burst into grateful tears. His kindness had cheered me up, I explained, and promised a prayer that he’d have a better day tomorrow. So I sent one up as I continued on my way, adding that his license plate began with BB, to insure he got the blessing. He’d done a mitzvah for me. In effect, hed given me a soothing pat on the back — as Melville advised we administer to each other in adversity. Near home I picked up Chinese food for dinner — General Tso’s Chicken (Mild) with broccoli — a favorite of mine and Honey’s. Sometimes I put kibble on her people food, only for crunchiness, though. Did you ever taste kibble? My dinner was delicious with a glass of Pinot Grigio. Amen. P.S. After kvetching for over a week — Yiddish is so expressive — I went to the doctor yesterday and found I’d been suffering with bronchitis — which apparently can’t be cured by willpower. Antibiotics, lots of liquids and rest should soon have me back to normal. Amen again.